I recently received a reader email asking how to get into human resources without experience. It made me pause, because I had just responded to an email asking virtually the same thing less than five minutes before. So I dug into my email and looked at how many times I’ve had a conversation with someone over the past five years about how to get into HR. The result? I’ve had over 250 conversations in just five years, and those don’t include the many interactions outside of email. Today I’m sharing my thoughts on the subject, some data from a recent survey I developed, and insights from other HR professionals on how to get into human resources without experience. This is going to be long, but it’s going to be good. First we’ll talk about some of the things you can leverage as you’re learning how to get into human resources. Figuring out how to get into your first HR job involves several aspects, and I’ve tried to be as thorough as possible in my discussions here. Some of these are obvious, and some are not. Some might be possible for your situation, and some may not. However, there’s a good chance that no matter who you are or where you’re located, you can put a few of these into practice to improve your chances. Networking or “who you know.” This isn’t about the “good ol’ boy” club. It’s about taking the time to meet others, learn about them, and find out how you can add value before you request something from them. Give before you take–that’s a life lesson right there, and it’s not just helpful as a suggestion for how to get into human resources. Internships. Yes, this bears mentioning because there are still plenty of organizations out there looking for some HR support/talent without the big bucks to pay for a full time, exempt-level professional. Some organizations don’t have intern programs, but they are open to starting them if provided the right information. Target smaller companies with only one or two HR people–you have a better chance of getting them to flex to the possibility of an HR intern than a large, established company with a complex hiring process. Retail management/supervisory responsibilities. Yes, leading and managing others in a retail (or food service, hospitality, etc.) environment is excellent experience as you explore the path for how to get into human resources without any experience. Bonus points if you have hiring, disciplinary, incentive, or termination experience. Administrative experience. This is the “yuck” of HR, but it’s also the easiest place to start and prove your value. Be the best darn filing clerk that there’s ever been–that experience lends itself to HR more than many of us would like to admit. Be able to see the value and opportunities that arise from this. I have a friend in Canada that I chat with via email occasionally, and she has built a valuable career out of consistently handling the details in a professional, thorough manner. Do HR where you are. This is the term I most commonly use to tell others to find opportunities to practice HR-related skills in a non-HR position. This includes building and sticking to a budget for your business unit, helping to recruit others into your department, working with managers (or as one) to help work through employee relations issues and coaching. Surprisingly, this actually was chosen as the most valuable way to prove value to a hiring manager (see the diagram below for more information). In the next section I talk more about how you can do this with a few specific examples. Volunteer for a nonprofit. Find a small nonprofit that has one HR person (or, as is typical for smaller organizations, a person with HR as one of many responsibilities) and try to find ways to support them as a volunteer. Maybe you’re helping to screen candidates. Maybe you’re checking references. Maybe you’re creating open enrollment packets for employees or administering an employee satisfaction survey. There are needs out there–it’s your job to find out what they might be and how you can plug in and help. Staffing/contract recruiting. This is one of the well-known tracks for how to get into HR without experience. Many have started with a staffing company and leveraged that recruiting and employee relations experience to get a job in the corporate HR world. If it turns out you really like and are good at this type of position, you can make more money than most HR people. I don’t recommend it if it’s not a good fit for you, but it’s something work looking into if you’re an extrovert and/or good at sales and networking. Temping in HR. Instead of helping to staff the company with employees as in the previous point, this puts you on the other side of the table as a contractor/temp with the staffing agency to work with an HR team. You might run into the same kinds of issues as trying to get a job in HR directly (i.e. no experience); however, it’s worth a shot if you can prove you have some of the key skills and experience that lend themselves to an HR role. Other? This is not a finished work! There are always new and innovative ways to gain experience, and I don’t have a monopoly on figuring out how to get a job in human resources. Have an idea to contribute? Feel free to leave a comment at the end of this article. If I was sitting where you are and reading these for the first time, I would be asking, “So how do these stack up in terms of relevance/importance? What’s most important?” Well, I’m glad you asked, because I have been running a survey for a few weeks, and the results are below in the graphic. I’ve seen a version of this question many times over the years. Often what people don’t realize is that they have specialized and/or significant experience in an area that is transferable to the HR profession. While some people may discount these experiences, others will quickly see the value. If you’re sitting across the table from an interviewer and they mention that you don’t have enough experience, ask for an example (the comment above provides a few areas: compensation and benefits, applicant tracking systems, etc.). Then think back over what you HAVE done and try to determine how you can “manufacture” that experience by cobbling together other projects and work. Here are a few examples of how real world work experiences can be related to HR. Compensation planning-Have you ever had to budget a resource (time, money, resources) to ensure fairness for all involved? Recruiting-Have you ever worked on a project or with a volunteer organization and helped to find people with the right skills to support the mission? Employee relations-Have you ever had the opportunity to help coworkers, friends, or family overcome a personality conflict that was affecting the relationship? Most of us have. Think about what you specifically did and what the results were. Training/Development-Have you ever looked at a process and figured out a way to do it better, then helped others to learn the new method? If so, you’re a trainer in some respects. I actually used this specific example while I was trying to get into human resources. I developed a training guide that helped new hires to learn their tasks quicker and that enabled us to provide even more support to the customers. Win-win! I have talked about this before in terms of “doing HR wherever you are.” If you’re working currently, start looking for opportunities to leverage as pseudo-HR experience. The more attention and time you give to this area, the better you can make yourself look during the application/interview process. 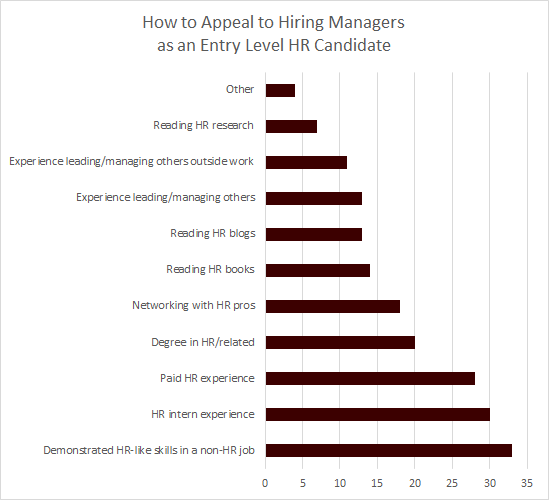 As you can see in the survey data above, this is the most important type of experience preferred by HR hiring managers! Read books. There are a wealth of HR book reviews here. Check them out! Read blogs like this one. You’ll learn about what it’s like working in this profession as well as some of the key trends that those even with a college education probably aren’t aware of. Blog yourself. Share what you’ve learned, research a new topic, or just pitch your opinions out there. I accept guest posts here from readers who want to share their thoughts with the world. The process of researching/writing helps you to learn better! Network with others locally or online. Ask them questions. That shared knowledge is an incredible thing to tap into. Attend local events. Here in Huntsville we have a free “best practices” lunch once a month. People show up with questions (or just as spectators) and kick around some of the problems they’re having at work. It’s a great chance to see the inner workings of the field from the trenches. Brush up on research information. Virtually every company in the HR technology market produces white papers, research reports, and other tools to help you stay on top of the absolute latest and greatest trends in the marketplace. Demo tools you will use in the job (applicant tracking systems, HRIS, HRMS, etc.). If jobs in your area are calling for Peoplesoft experience, try to get a Peoplesoft demo lined up. If you’re going to be looking for a recruiting slot, find out how applicant tracking systems work (I’d recommend looking at SmartRecruiters’ product). Ask them what they need specifically. You might get an answer you weren’t expecting, or maybe you can use one of the examples above to meet their needs and overcome the perceived obstacle. I went into extensive detail on how to do these types of activities in my article How to Learn HR (for free). As a side note here, I almost always tell people NOT to pursue a master’s degree in HR or another field until they have some actual HR work experience. I understand that it’s easy to just roll right into grad school studies after completing a degree, but it’s much more important to jump into the workplace, get some experience, and learn a little about the field before continuing on. What if you hate HR when you get into it? Having two degrees is going to make you feel pressured to stay. Or maybe you realize you like HR but want to be a manager/leader one day, so an MBA would be more valuable than a Master’s in HR degree? Whatever the case, hold off on additional education until you actually have experience–you will appreciate the education more and will be able to relate it to hands-on scenarios that you see regularly. Let’s do a little exercise to help you understand and put these principles into action. I’m going to use an entry level HR assistant job description and we will go through bullet by bullet point and give examples of how you can write your resume or respond to interview questions to highlight your capabilities. Your first HR job might not provide the same experience to fit these bullets exactly, but it’s a great starting place as you are learning how to get into HR. 89% of survey respondents would allow candidates to use non-work examples to lieu of HR experience. Performs customer service functions by answering employee requests and questions. How have you been a point of contact previously for answering questions and directing others to helpful resources? Conducts benefits enrollment for new employees. How have have you worked with others to complete necessary documentation where details are extremely important? Verifies I-9 documentation and maintains books current. Have you maintained documentation in a secure location? Bonus: can you fill out an I9 form? Submits the online investigation requests and assists with new employee background checks. Have you ever handled confidential or sensitive information? How are you with process flows on computers or the Web? Performs payroll/benefit-related reconciliations to General Ledger and other accounts. Reconciles benefits statements. Can you reconcile a bank statement? This is one of the basic, yet important, tasks of a first HR job. Conducts audits of various payroll, benefits or other HR programs and recommends any corrective action. Have you ever had to maintain data integrity in a project, including having to go back and double check the work of yourself or others to ensure completeness and accuracy? Updates HR spreadsheet with employee change requests and processes paperwork. How are you with keeping up with the little details and tracking your progress when there are multiple steps to a process? Assists with processing of terminations. Same as previous answer. Assists with the preparation of the performance review forms. This can be tedious with many employees, but it’s a critical business function. This also touches on sensitive employment information. Assists with recruitment and interview process. Are you good with speaking on the phone? In person? What about managing several schedules and trying to squeeze in meeting times on two or more conflicting calendars? Schedules meetings and interviews as requested by HR Manager. Same as previous. Makes photocopies, faxes documents and performs other clerical functions. Are you good with the nitty gritty details? Are you okay with doing the basic work it takes to learn from the ground up? If you even have an inkling of “I’m too good for this” then you might need to re-evaluate your career now! Files papers and documents into appropriate employee files. Same as previous answer. Assists or prepares correspondence. How are your writing skills? Can you write concisely, yet with enough information to convey your thoughts? Do people often ask for clarification on things you’ve written to them, or do they easily understand your written communications? Prepares new employee files. The basic building block of HR. Have you ever had to process paperwork in a special way, with special rules, with sometimes-exciting details, yet had to keep it all to yourself? That’s this task in a nutshell. Competencies: To perform the job successfully, an individual should demonstrate the following competencies to perform the essential functions of this position. Problem solving—the individual identifies and resolves problems in a timely manner and gathers and analyzes information skillfully. Think about how you have used available information to solve problems and arrive at solutions. What’s your own personal process like? Ever received any feedback from others? Interpersonal Skills—the individual maintains confidentiality, remains open to others’ ideas and exhibits willingness to try new things. This is going to be your most valued asset in an HR role. When have you helped others to arrive at solutions to personal/interpersonal problems? How have you kept things confidential in the past? Oral communication—the individual speaks clearly and persuasively in positive or negative situations, demonstrates group presentation skills and conducts meetings. Have you ever led meetings or presentations? How solid are you with presenting in front of groups? How do you handle small group interaction when the topics are uncomfortable? Written Communication—the individual edits work for spelling and grammar, presents numerical data effectively and is able to read and interpret written information. How well do you write and convey information? Planning/organizing—the individual prioritizes and plans work activities, uses time efficiently and develops realistic action plans. Can you plan and organize? What’s your method (calendar invites, to do list, etc.)? How do you prioritize personally? Quality control—the individual demonstrates accuracy and thoroughness and monitors own work to ensure quality. Do you catch your own mistakes? What about the mistakes of others? How often do you make mistakes that others have to catch and fix? How do you respond? Adaptability—the individual adapts to changes in the work environment, manages competing demands and is able to deal with frequent change, delays or unexpected events. Have you ever been in a situation that was fluid and rapidly changing? How did you cope? How did you stay on top of the changes? How did you adjust your approach based on new information/inputs? Dependability—the individual is consistently at work and on time, follows instructions, responds to management direction and solicits feedback to improve performance. How are you MORE dependable than the other candidates? What have others said about your dependability in the past? Safety and security—the individual actively promotes and personally observes safety and security procedures, and uses equipment and materials properly. How have you had to focus on safety/security in previous roles/projects? How do you keep it in focus over the long term? Whew. See, that was a long exercise, but it was worth it, because now you see some of the critical areas that you need to focus on as it relates to how to get into human resources. Maybe you’re good on most, but we can all stand to shore up weak areas and ensure that we highlight our strengths during the interview process. When I hire an entry level HR person, I’m looking for attitude, culture fit, and being trainable. If you have all that and some HR knowledge, that’s great. If you have HR knowledge and none of that, then you won’t make it past the first interview. Remember that. People like to put a lot of stock in the value of education, often too much so. I learned about 20% of what I need to do my job in college with an actual HR degree. The other 80% was picked up over time, and those key skills include communication, influence, emotional intelligence, etc. Very much soft skills! Oh, and if you do everything I mention in this article and don’t have a good attitude, then you are sabotaging your chances. One thing is for sure, every HR department has its own policies, processes, and preferences. Just because you have a year or two of experience in an HR role elsewhere doesn’t mean it translates easily. That’s something hiring managers should definitely keep in mind, and something you can use to your advantage when trying to prove you have what it takes for the role. What do your interviewers want? Do they want work samples? Good answers to interview questions? In short, what proof of your capabilities are they looking for and how can you demonstrate those capabilities? Know this before you get to the interview, if you can. The most important skill to have in an HR job is a service mentality. You’re there to take care of the employees, not for them to take care of you. Sometimes, despite everything, people still will not select you. It requires someone with the right mindset–someone dead set on experience is never going to pick you. You’re targeting that vast majority in the middle that know that the right “fit” is better than the right education or experience in most cases. Another possibility, especially in a tough job market, is that they had someone apply with the right mindset AND some experience. Again, that’s not something you can control, but it’s something you should be aware of. Do a personal SWOT analysis. You will not look like the most qualified person by accident, especially if you lack direct experience. Be able to speak to your strengths and weaknesses, but also look at opportunities (things you can capitalize on that others maybe couldn’t). The better you know yourself the more capable you will seem to be as you formulate your approach for how to get into human resources. Use the right words on your resume. If you have experience or training with HIPAA, FMLA, FLSA, etc., then definitely include that. Hiring managers (even in HR) are human, and it helps to see things that make us feel like you know what you’re doing. This applies doubly if the job ad you’re applying for lists any of the terminology or buzzwords. I asked HR hiring managers in the survey what sort of characteristics they are looking for in their entry level candidates. Here’s what they had to say. I tried to pull in as many comments as I could, but there were so many great ones I had to leave a few out to keep this from turning into a full-size book! I sincerely appreciate everyone who took the time to respond! This is meant to be comprehensive, but there are many facets to this discussion so naturally I’ll point you to some additional resources. One of the key ones is the Entry Level HR Jobs ultimate guide I put together. It has some great material to take what you’ve learned today even further. In addition, the Entry Level HR course I put together has some great content on developing your strengths, negotiating your salary, and managing your own professional development throughout your career. I’d recommend checking it out if you are looking for an edge over the competition. Thanks for sticking with me and reading through this guide. Hopefully you learned some helpful information and can put that into practice now that you’ve learned how to get your first human resources job! Do you have anything to add in the comments below? What has your experience been? Let’s keep this going to be as valuable and up-to-date as possible! This entry was posted in General, Video and tagged Career Advice, entry level hr, Ultimate Guide on March 31, 2014 by Ben. I have REALLY enjoyed reading this guide! I have been searching online for help with and have read numerous articles on how to get into HR with no experience for some time now. And while a few sources offered some good advice, none of them have displayed the great level of insight of this article!! Wow!! I was truly impressed! You laid everything out so clearly and introduced concepts that weren’t only simple but profound. I was beginning to lose hope on finding an entry level HR position and began to doubt my ability to begin a career in this field. But, your article and it’s advice gave me new hope! I am excited now!! I also took the time to read your other guide on entry level HR jobs. I also took the time to read your bio and your goal for this website. You have a new follower and I am also signing up for an email subscription. Thank you for help and for being an inspiration for those of us still looking to get our break in the HR field! 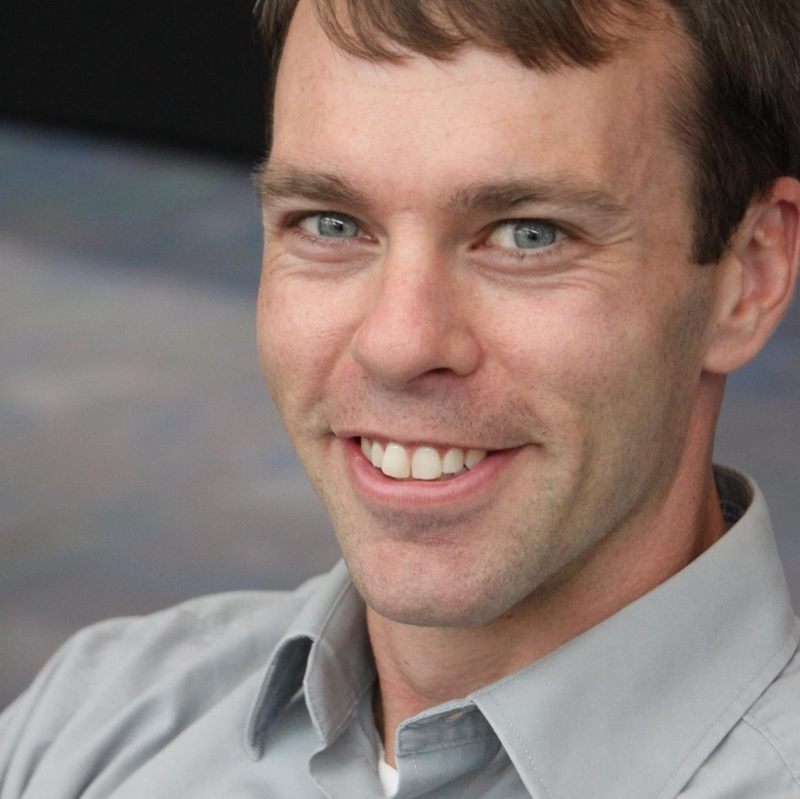 Thank you Ben for sharing this insightful guide along with all the helpful information on upstart HR. Your dedication to your profession and desire to help others find their path or improve their daily work is inspiring.